Psoriasis is a chronic, inflammatory autoimmune skin disease. Inherited genetic defects that adversely affect the immune system cause psoriasis. Plaque psoriasis is the most common form of psoriasis. Obesity, diabetes, and heart disease are more common in people with psoriasis. Flare-ups of psoriasis can be initiated by certain environmental triggers. Although symptoms and signs vary, they include red, scaling plaques of itchy, elevated skin affecting the elbows, knees and scalp. Psoriasis is controllable with medication. There are many promising new therapies, including newer biologic drugs. Psoriasis is a noncontagious, chronic skin disease that produces plaques of thickened, scaly skin. The dry flakes of silvery-white skin scales result from the excessively rapid proliferation of skin cells. Psoriasis is fundamentally a defective inflammatory response. The proliferation of skin cells is triggered by inflammatory chemicals produced by specialized white blood cells called T-cells. Psoriasis commonly affects the skin of the elbows, knees, and scalp. The spectrum of this disease ranges from mild with limited involvement of small areas of skin to severe psoriasis with large, thick plaques to red inflamed skin affecting the entire body surface. Psoriasis affects all races and both sexes. Although psoriasis can be seen in people of any age, from babies to seniors, most commonly patients are first diagnosed in their early adult years. The self-esteem and quality of life of patients with psoriasis is often diminished because of the appearance of their skin. Recently, it has become clear that people with psoriasis are more likely to have diabetes, high blood lipids, cardiovascular disease, and a variety of other inflammatory diseases. This may reflect an inability to control inflammation. Caring for psoriasis takes medical teamwork. Picture of plaque psoriasis on the legs. Source: iStock.com. The exact cause remains unknown. A combination of elements, including genetic predisposition and environmental factors, are involved. 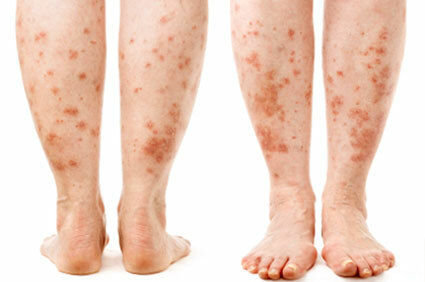 It is common for psoriasis to be found in members of the same family. Defects in the immune system and the control of inflammation are thought to play major roles. Certain medications like beta-blockers have been linked to psoriasis. Despite research over the past 30 years, the "master switch" that turns on psoriasis is still a mystery. Guttate psoriasis symptoms and signs include bumps or small plaques (½ inch or less) of red itchy, scaling skin that may appear explosively, affecting large parts of the skin surface simultaneously, after a sore throat. Sometimes lab tests, including a microscopic examination of tissue obtained from a surgical skin biopsy, may be necessary. Occasionally, it can be difficult to differentiate eczematous dermatitis from psoriasis. This is when a biopsy can be quite valuable to distinguish between the two conditions. Of note, both eczematous dermatitis and psoriasis often respond to similar treatments. Certain types of eczematous dermatitis can be cured, which is not the case for psoriasis. Picture of plaque psoriasis on the elbows. Source: Bigstock.com. 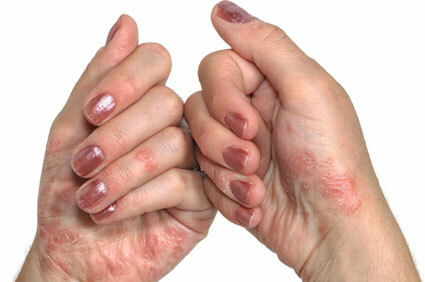 Picture of psoriasis on the hands. Source: iStock.com. A proposal to minimize the toxicity of some of these medicines has been commonly called "rotational" therapy. The idea is to change the anti-psoriasis drugs every six to 24 months in order to minimize the toxicity of one medication. Depending on the medications selected, this proposal can be an option. An exception to this proposal is the use of the newer biologic medications as described below. An individual who has been using strong topical steroids over large areas of their body for prolonged periods may benefit from stopping the steroids for a while and rotating onto a different therapy. Topical corticosteroids (steroids, such as hydrocortisone) are very useful and often the first-line treatment for limited or small areas of psoriasis. These come in many preparations, including sprays, liquid, creams, gels, ointments, and foams. Steroids come in many different strengths, including stronger ones that are used for elbows, knees, and tougher skin areas and milder ones for areas like the face, underarms, and groin. These are usually applied once or twice a day to affected skin areas. Strong steroid preparations should be limited in use. Overuse or prolonged use may cause problems, including potential permanent skin thinning and damage called atrophy. Moisturizers, especially with therapeutic concentrations of salicylic acid, lactic acid, urea, and glycolic acid may be helpful in psoriasis. These moisturizers are available as prescription and nonprescription forms. These help reduce the scales that impede the movement of topical medications into the deeper layers of the skin. Some available preparations include salicylic acid (Salex) and lactic acid (AmLactin, Lac-Hydrin). These may be used one to three times a day on the body. Other bland moisturizers, including Vaseline and Crisco vegetable shortening, may also be helpful in at least reducing the dry appearance of psoriasis. Immunomodulators (tacrolimus and pimecrolimus) have also been used with some limited success in mild psoriasis. These have the advantage of not causing skin thinning. They may have other potential side effects, including skin infections and possible malignancies (cancers). The exact association of these immunomodulator creams and cancer is controversial. Coal tar is available in multiple preparations, including shampoos, bath solutions, and creams. Coal tar may help reduce the appearance and decrease the flakes in psoriasis. The odor, staining, and overall messiness with coal tar may make it less desirable than other therapies. A major advantage with tar is lack of skin thinning. Anthralin is available for topical use as a cream, ointment, or paste. The stinging, possible irritation, and skin discoloration may make this less acceptable to use. Anthralin may be applied for 10-30 minutes to psoriatic skin. Oral medications include methotrexate (Trexall), acitretin (Soriatane), cyclosporine (Neoral), apremilast (Otezla), and others. Oral prednisone (corticosteroid) is generally not used in psoriasis and may cause a disease flare-up if discontinued. Acitretin (Soriatane) is an oral drug used for certain types of psoriasis. It is not effective in all types of the disease. It may be used in males and females who are not pregnant and not planning to become pregnant for at least three years. The major side effects include dryness of skin and eyes and temporarily elevated levels of triglycerides and cholesterol (fatty substance) in the blood. Blood tests are generally required before starting this therapy and are needed periodically to monitor triglyceride levels. Patients should not become pregnant while on this drug and usually avoid becoming pregnant for at least three years after stopping this medication. Cyclosporine is a potent immunosuppressive drug used for other medical uses, including organ transplantation. It may be used for severe, difficult-to-treat cases of widespread psoriasis. Improvement and results may be very rapid in onset. It may be hard to get someone off of cyclosporine without flaring their psoriasis. Because of the potential cumulative toxicity, cyclosporine should not be used for more than one to two years for most psoriasis patients. Major possible side effects include kidney and blood-pressure problems. Methotrexate is a common drug used for rheumatoid arthritis, and it has been used effectively for many years in psoriasis. It is usually given in small weekly doses (5 mg-25 mg), either orally or by injection. Blood tests are required before and during therapy. The drug may cause liver and lung damage. Close physician monitoring and monthly to quarterly visits and labs are generally required. FDA has approved a new oral drug, apremilast (Otezla), to treat psoriasis and psoriatic arthritis, with an entirely novel mode of action (inhibition of an enzyme, phosphodiesterase 4) and does not require intensive laboratory monitoring. Drug choice can be complicated, and your physician will help in selecting the best option. In some patients, it may be possible to predict drug efficacy on the basis of a prospective patient's genetics. It appears that the presence of the HLA-Cw6 gene is correlated with a beneficial response to ustekinumab. Newer drugs are in development and no doubt will be available in the near future. As this class of drugs is fairly new, ongoing monitoring and adverse effect reporting continues and long-term safety continues to be monitored. Biologics are all comparatively expensive especially in view of the fact they none of them are curative. Recently, the FDA has attempted to address this problem by permitting the use of "biosimilar" drugs. These drugs are structurally identical to a specific biologic drug and are presumed to produce identical therapeutic responses in human beings to the original, but are produced using different methodology. Biosimilars ought to be available at some fraction of the cost of the original. If this will be an effective approach remains to be seen. The only biosimilar available currently is infliximab (Inflectra). Two other biosimilar drugs have been accepted by the FDA, an etanercept equivalent (Erelzi) and an adalimumab equivalent (Amjevita) -- but currently, neither are available. Some biologics are to be administered by self-injections for home use while others are given by intravenous infusions in the doctor's office. Biologics have some screening requirements such as a tuberculosis screening test (TB skin test or PPD test) and other labs prior to starting therapy. As with any drug, side effects are possible with all biologic drugs. Common potential side effects include mild local injection-site reactions (redness and tenderness). There is concern of serious infections and potential malignancy with nearly all biologic drugs. Precautions include patients with known or suspected hepatitis B infection, active tuberculosis, and possibly HIV/AIDS. As a general consideration, these drugs may not be an ideal choice for patients with a history of cancer and patients actively undergoing cancer therapy. In particular, there may be an increased association of lymphoma in patients taking a biologic. Although dietary studies are notoriously difficult to perform and interpret, it seems likely that an anti-inflammatory diet whose fat content is composed of polyunsaturated oils like olive oil and fish oil is beneficial for psoriasis. The so-called Mediterranean diet is an example. Light therapy is also called phototherapy. There are several types of medical light therapies that include PUVA (an acronym for psoralen + UVA), UVB, and narrow-band UVB. These artificial light sources have been used for decades and generally are available in only certain physician's offices. There are a few companies who may sell light boxes or light bulbs for prescribed home light therapy. PUVA is a special treatment using a photosensitizing drug and timed artificial-light exposure composed of wavelengths of ultraviolet light in the UVA spectrum. The photosensitizing drug in PUVA is called psoralen. Both the psoralen and the UVA light must be administered within one hour of each other for a response to occur. These treatments are usually given in a physician's office two to three times per week. Several weeks of PUVA is usually required before seeing significant results. The light exposure time is gradually increased during each subsequent treatment. Psoralens may be given orally as a pill or topically as a bath or lotion. After a short incubation period, the skin is exposed to a special wavelength of ultraviolet light called UVA. Patients using PUVA are generally sun sensitive and must avoid sun exposure for a period of time after PUVA. Common side effects with PUVA include burning, aging of the skin, increased brown spots called lentigines, and an increased risk of skin cancer, including melanoma. The relative increase in skin cancer risk with PUVA treatment is controversial. PUVA treatments need to be closely monitored by a physician and discontinued when a maximum number of treatments have been reached. Sometimes UVB is combined with other treatments such as tar application. Goeckerman is a special psoriasis therapy using this combination. Some centers have used this therapy in a "day care" type of setting where patients are in the psoriasis treatment clinic all day for several weeks and go home each night. Alwan, W., and F.O. Nestle. "Pathogenesis and Treatment of Psoriasis: Exploiting Pathophysiological Pathways for Precision Medicine." Clin Exp Rheumatol 33 (Suppl. 93): S2-S6. Arndt, Kenneth A., eds., et al. "Topical Therapies for Psoriasis." Seminars in Cutaneous Medicine and Surgery 35.2S Mar. 2016: S35-S46. Benhadou, Fairda, Dillon Mintoff, and Véronique del Marmol. "Psoriasis: Keratinocytes or Immune Cells -- Which Is the Trigger?" Dermatology Dec. 19, 2018. Conrad, Curdin, Michel Gilliet. "Psoriasis: From Pathogenesis to Targeted Therapies." Clinical Reviews in Allergy & Immunology Jan. 18, 2015. Dowlatshahi, E.A., E.A.M van der Voort, L.R. Arends, and T. Nijsten. "Markers of Systemic Inflammation in Psoriasis: A Systematic Review and Meta-Analysis." British Journal of Dermatology 169.2 Aug. 2013: 266-282. Georgescu, Simona-Roxana, et al. "Advances in Understanding the Immunological Pathways in Psoriasis." International Journal of Molecular Sciences 20.739 Feb. 10, 2019: 2-17. Kaushik, Shivani B., and Mark G. Lebwohl. "Review of Safety and Efficacy of Approved Systemic Psoriasis Therapies." International Journal of Dermatology 2018. National Psoriasis Foundation. "Systemic Treatments: Biologics and Oral Treatments." 1-25. Ogawa, Eisaku, Yuki Sato, Akane Minagawa, and Ryuhei Okuyama. "Pathogenesis of Psoriasis and Development of Treatment." The Journal of Dermatology 2017: 1-9. Stiff, Katherine M., Katelyn R. Glines, Caroline L. Porter, Abigail Cline & Steven R. Feldman. "Current pharmacological treatment guidelines for psoriasis and psoriatic arthritis." Expert Review of Clinical Pharmacology (2018). Villaseñor-Park, Jennifer, David Wheeler, and Lisa Grandinetti. "Psoriasis: Evolving Treatment for a Complex Disease." Cleveland Clinic Journal of Medicine 79.6 June 2012: 413-423. Woo, Yu Ri, Dae Ho Cho, and Hyun Jeong Park. "Molecular Mechanisms and Management of a Cutaneous Inflammatory Disorder: Psoriasis." International Journal of Molecular Sciences 18 Dec. 11, 2017: 1-26.